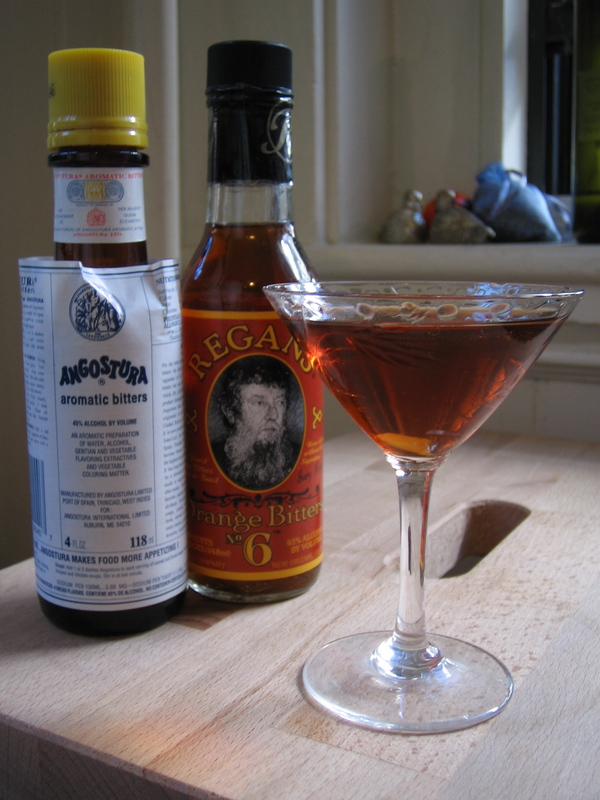 Yes, we are talking about vermouth again, both here and in our column in The Weekly Dig. I’ll admit, the story idea came to me after taking my sixth or seventh order for a “Grey Goose Martini, extra extra dry, extra extra dirty, with extra olives,” during a busy Thursday evening shift at Toro. “What if all of those drinkers put a spirit and a mixer with actual flavor into their glasses, rather than covering up chilled vodka with a tablespoonful of olive brine?” I wondered. I suspected these drinkers might enjoy a “wet” martini. After my shift ended, I hopped back behind the bar with MiMi, who works at Toro too, and we put our theory to the test. We mixed up a massive glass of Grey Goose shaken with a generous dollop of olive brine, and a gin martini with 2 parts Bombay Sapphire and 1 part Martini & Rossi dry vermouth stirred over ice and tasted them against one another. The Grey Goose dirty thing tasted saltier than I remembered, presenting a flavor profile that no drink made sans olive brine could hope to match. But the gin martini tasted to both of us as we suspected: balanced and slightly savory. GUY #1: (A friend of GUY #4, who I suspect was more interested in talking to the pretty ladies.) So, wait…this one is the vodka thing? It’s good. And this one is the gin thing? This is the one you like better? Yeah…it’s delicious. So anyway, what’s your name? GUY #2: (A chef who is well-acquainted with the local cocktail scene.) Yeah, it’s more balanced than the dirty vodka thing. And the vermouth is really light and refreshing. Can I have another PBR now? GUY #3: (Clearly a bit more intoxicated than the rest.) So wait, this is Grey Goose? Yeah, that’s the best kind. This dirty martini is way, way better than the other one. Not even a question. The other one doesn’t even taste like vodka. I remember this one time when I was drinking vodka at a concert and [INSERT MEANDERING STORY WITH COMPLETELY IRRELEVANT POINT HERE]. GUY #4: (A beloved regular, also rather intoxicated.) What are we doing again? You want me to taste something? 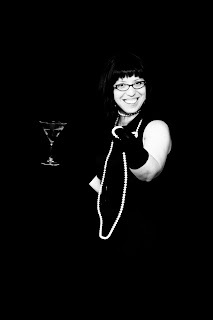 And the moral of the story is, when a LUPEC gal invites you over the taste-test martinis, it’s not a joke. We’re using Beefeater gin, Noilly Prat vermouth, and Angustora orange bitters that we got through bartering on the black market. Fees Orange bitters are somewhat more available in local shops. Or look on-line. Also known as a “travel bar,” these can be found in a wide range of sizes and styles. The featured photo was not staged; I snapped this at a hotel on the Jersey shore. My travel companion and I had been road tripping all day and were getting ready for dinner while sipping the martini featured in the Dig. 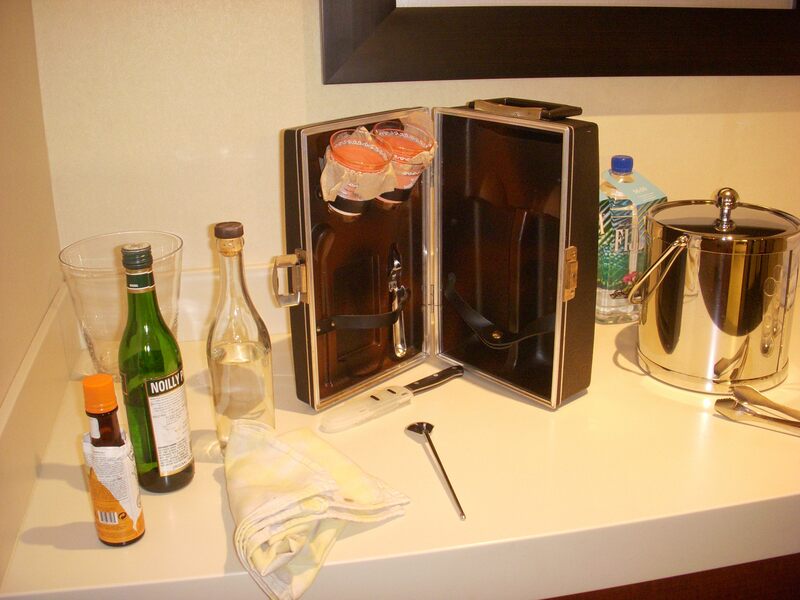 The case is an older one made of plastic and metal and includes space for two small bottles, a flask, small glasses, a stirring spoon, and an opener. We carry what you see here. The gin goes into a smaller bottle to save space, and the two plastic cups have been replaced with four unstemmed vintage cocktail glasses protected with sheets of papertowel. These are put into service when no other glassware is handy. We also add in a paring knife and a kitchen towel. With ice provided by the hotel, we are good to go. Shake the gin, lemon juice, and simple syrup (a splash or to taste) with ice, pour in stemmed glass and top with sparkling wine. Other variations include cognac rather than gin as well as different glassware. Stir the ingredients with ice and serve up or on the rocks. A twist of orange is the least offensive garnish I’ve seen served with this drink. Hanky Panky’s column in this week’s Dig advocates building your home bar on a cocktail by cocktail basis: each week, choose a favorite cocktail and purchase the items necessary to mix it at home. With this method, you will never be left wondering what you can mix with the items you have on hand while adding to your encyclopedic knowledge of cocktail recipes. Below are some recipes to help get you started, economically of course — who knows what will happen to the market next. For gin, we recommended the Hearst. You’ll need all of these ingredients for many other cocktails, so its a great way to invest your money from the start. Stir and strain into a chilled cocktail glass. Garnish with lemon oil. This Boston original gets a bottle of rye in your liquor cabinet, and fresh grenadine in your fridge. Where they both belong. The Hibiscus cocktail is a great way to deal with some light rum and make sure you’ve got French vermouth in the cabinet, too. From Trader Vic’s Bartender’s Guide, Revised. Shake with ice cubes. Strain into a chilled cocktail glass. This LUPEC Boston namesake will trick out your liquor cabinet with a few fun extra ingredients, and make tequila feel quite at home among the other bottles. Shake all ingredients and pour into a tiki mug or tall glass filled with crushed ice and the reserved 1/2 lime. Garnish with mint sprig & straw. Oh, how your liquor cabinet grows! Today was a big day for the ladies of LUPEC Boston. No, it’s not because we’re so excited about Women’s History Month starting tomorrow we can’t even stand it! 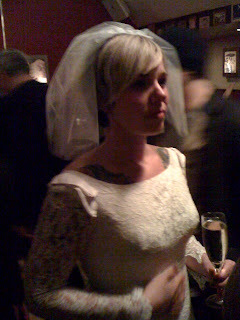 It’s because one of LUPEC Boston’s very own tied the knot today! 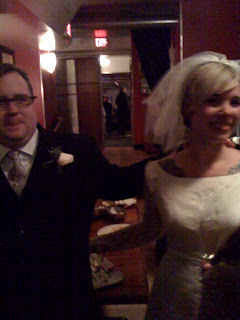 That’s right, today Miss Contessa became a Mrs. She and her beloved just couldn’t let Leap Day go by without doing something special…so they got hitched this morning at city hall! Then it was off to Harvard Square to get matching nuptial tattoos. A very special wedding reception was held in their honor this afternoon at Silvertone. LUPEC Boston was very well represented. We were positively overjoyed when the bride & groom made their grand entrance , looking as picture perfect as the figurines atop a wedding cake. Let’s raise a glass of one of these to the nuptial couple this weekend! Stir in mixing glass with ice & strain. Serve in a cocktail glass. Shake in iced cocktail shaker & strain. Serve in a cocktail glass. Various definitions from the Oxford English to the American Heritage Dictionaries include “questionable or underhanded activity”, “sexual dalliance”, “trickery, double-dealings”, shenanigans”, “hocus-pocus”. I like the Hanky-Panky. It’s got a great backstory, mysterious etymology, association with our president (LUPEC Boston’s that is, not the doofball in D.C.), and is simply a fine cocktail, back from the brink of extinction. Stir and strain into a cocktail glass. Squeeze the oil from an orange peel on top. The drink, created in the 1920’s, is a variation on the original (sweet) Martini. It nicely utilizes the herbalicious Italian liqueur Fernet Branca. In spirit, it reminds me of another punchy drink with a potentially-overwhelming-but-not herbal liqueur element, the Alaska, made with Chartreuse. Bartender Harry Craddock filled Ada’s role managing the bar in 1924, after he had left dry America for work abroad. In 1930, he published “The Savoy Cocktail Book”, an Art Deco gem & many a bartender’s Bible. In it, for the first time is the printed recipe for the Hanky-Panky. The Catholic Church, hocus-pocus. Ada Coleman, Hanky Panky. Shenanigans. I’ll drink to that.